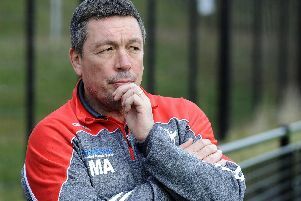 Out of luck, a persistent injury list and a daunting return to London Broncos, but you won’t find Sheffield Eagles director of rugby Mark Aston sulking. He may have had some harsh home truths for some members of his ailing squad after last weekend’s heavy defeat to the Broncos, but the determination and will for success hasn’t diminished as the long-serving coach looks to find a way forward after two damaging defeats. It has been a trying couple of years for the Eagles, but after seemingly winning their off the field battle, Aston is in no mood to throw in the towel with his current crop, instead promising to keep putting in the hours as he looks to keep the Eagles in the Betfred Championship. “I have to keep my spirits up, if not I would go insane,” Aston explained to The Star. “I would be a broken man. I’ll dust myself down and we’ll have a look at things this week, and then we’ll go to London for a long journey and a tough game. Out of luck on the injury front, Aston did receive some joy last weekend with the return of Menzie Yere who has been kicking his heels on the sidelines all season while he waited on the resolution of visa issue which prevented him from playing. Full-back Corey Makelim should return after missing the London defeat through illness, but this weekend may come too soon for the likes of Josh Toole, Matty James and Matty Fozard. Experienced half-back Simon Brown is still a way from a return, with the luckless Aston hoping for a change of circumstances or divine intervention as he seeks a much needed revival. He added: “What I am committed too is working hard, the backroom staff will be the same, and then hopefully somewhere there will be someone up there looking down on us thinking, you know what these guys here need a little bit of help. We then might get the bounce of the ball, we might get a bit of luck because we certainly need a little bit at this time.